At the 2012 MotoGP at Sachsenring, BMW displayed the all-new 7 Series Facelift. The 7er displayed wasn’t an ordinary model, but rather the high-end variant 760Li BMW Individual. The new flagship goes on sale this summer and in Germany it starts at 147,900 euros. In combination with the BMW Individual package, the 760Li offers an exclusive combination of colors and materials. The long-wheelbase 7er is painted in the Individual Citrin Black color and comes equipped with 20 inch alloy-wheels type V-Spoke 301. Inside, the Satin Walnut Honey Brown wood trim gives the car an exclusive and refined look. The Adaptive LED Headlights, which are optional on those models and standard on the 760Li give the car an even more road-focused look. The Corona light rings for the parking lights and daytime running lights also featuring LEDs. 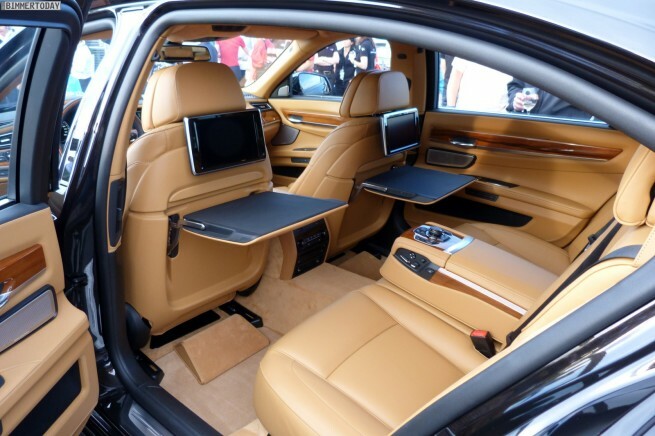 The new BMW 7 Series offers individual rear comfort seats as standard equipment on the 760Li and optional on other models. They can be adjusted to suit individual requirements. The backrest angle and seat position can both be varied, as can the position of the head restraints. This 760Li Individual includes the optional Rear Seat Entertainment Package with an iDrive controller and two 9.2-inch screens which. To justify its premium price tag, the 760i also features the Bang & Olufsen High-End Surround Sound System that produces an exceptionally natural sound from 16 speakers distributed around the cabin. At market launch, the revised 7 Series comes equipped with the new iDrive Navigation System. Armed with a faster processor and additional video processing capabilities, along with 250 GB of storage, the new ConnectedDrive navigation system delivers enhanced usability, with greater visual appeal, and better reliability. Some of the new features introduced this week are the 3D mapping, Dictation function, and split screen guidance, called ‘High Guiding’. Under the hood, the 760Li sports a 6.0-liter V12 all-aluminum engine with TwinTurbo Technology and High Precision Injection with fuel injected directly into the combustion chambers. The engine produces 535 horsepower and 550 lb-ft of torque. It runs from 0 to 60 mph in only 4.5 seconds. Esther Mahlangu has now, for the second time, joined forces with BMW and refined a BMW 7 Series, in collaboration with the BMW Individual Manufaktur.